I’m excited to have the lovely Kelly Gay here for a few questions today. 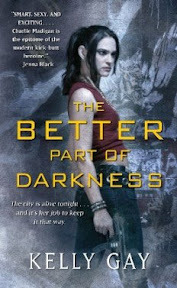 Kelly’s fantastic Urban Fantasy The Better Part of Darkness will debut this coming Tuesday. My ramblings about this terrific read are here. I want to share the pleasure of reading The Better Part of Darkness, that means a giveaway. One lucky commenter will get a copy for their own reading pleasure. Details are at the end of this post. Well, let’s see… Just your average bookworm who loves to spend a lot of time in make-believe places. I have two kids, live in the ‘burbs with a Great Dane named Yeager and two very large cats (brother and sister). I’ve had a lot of random jobs through-out my life. I can drive a dump truck and a backhoe. I can tar and shingle a roof, and frame out a house. I can thread films through projectors, clean your house, wait on your table, and sell you men’s underwear (a talent, I tell you!). I spent several years working with horses – show barn manager, groom, exercise rider, but the best was playing nurse at a big breeding farm. I helped delivery sixty-five foals in one season. THE BETTER PART OF DARKNESS is your debut novel, tell us about it. How did you come up with the title for THE BETTER PART OF DARKNESS? The title came before the initial idea. I was looking for a better title for a paranormal romance novel I’d written. I was just playing around putting words and phrases with ‘Darkness’ when I hit on the right combination of words. I knew it was special, so I saved it. This was also right around the time I was playing with ideas for a new story, one where I wanted to explore the what-if question: What if our myth/beliefs of heaven and hell were based in truth, in real places? How did you come up with the characters? I'm curious because you don't see many divorced moms in Urban Fantasy as a main character. I’m never sure how the characters come to me; they just seem to show up in the world already stewing in my head. I knew the next book I’d write would be urban fantasy, and I knew I wanted to go outside some boundaries with my heroine. From the very beginning, Charlie presented herself as a mom and a divorcee. I’d just always pictured her that way, someone with a complex past and a lot of realism living in this alternate world. The choice for me was whether to keep her a mom, since I wasn’t sure if readers would accept the whole mom/dangerous job thing. But then all I had to do was look at all these real-life women heroes. The cops, the federal agents, the women in the military, and I knew that if nothing else, it worked for Charlie and it worked for me. What was the hardest part of writing THE BETTER PART OF DARKNESS? It wasn’t a hard book to write. The hard part was finding the time to sit down and work on it. I was pregnant, like BIG and miserable, while writing this book, taking a full course load of classes at the local college (yes, I am probably the world record holder for how long it’s taking me to finish my degree), and we’d just moved into a new house… I started feeding chapters to my critique partner, and she kept requesting more. It was her enthusiasm that made me sit down, when I was exhausted, and complete this book. My being a published author is all her fault. Are you happy with cover art for your book? Did you get any say so in the cover art? Yes. I’m very happy with it! When my editor told me that Chris McGrath was doing the art work, I was *happy dancing* all over the place. I know every author’s experience is different as far as input, but my editor really wanted to make sure I was happy with the cover. I was able to share my thoughts--my likes and dislikes, which were actually taken into account. In the end, though, I knew that final decisions on things would not be mine. And I totally get that part of the process. It’s business. I’m just very lucky to have an editor who thinks of our relationship as a partnership. He really wants to know how I feel about things, and I am so grateful for that! How many books do you have planned for the Charlie Madigan series? In my initial deal with Pocket, I sold a sequel, which is coming out Aug, 31, 2010 called THE DARKEST EDGE OF DAWN. I’ve plotted through to the third book, and have that proposal out now. I’d love to see Charlie work through some of her issues, and explore some of the relationship things that are coming her way. How does it feel to have your first book published? Has it lived up to your expectations so far? It feels incredible. There are some days where I have these quiet moments – like, is this for real? Is this really happening to me? I got so comfortable in my role of aspiring writer; I mean, that was a role I took on almost fifteen years, so, now, stepping into this new role – it’s still a little unbelievable at times. I’d like to sleep. But when I’m not writing, I have a million other things to do – taking care of the house, the animals, the kids… There’s hardly time when everything is done and I can just chill, but when there is, you’ll most likely find me taking a walk, coloring with my kids, or online playing Aion with my kickass female gladiator (named after a Sherrilyn Kenyon Dark Hunter character), who has wings, people! Beautiful, angelic white wings! Congratulations on your new YA series, Gods & Monsters! The first book is titled DARKNESS BECOMES HER (I love the titles of your books), can you tell us about it? DARKNESS BECOMES HER is my new YA novel, which releases Spring 2011 from Simon Pulse, with a second book a year later. I call the series, ‘GODS & MONSTERS’, but I don’t know yet if that will change. It’s dark, urban fantasy, set in a post apocalyptic-like New Orleans (forsaken and abandoned by the government and most of its inhabitants due to two massive hurricanes that destroyed the city a decade earlier). It's now a sanctuary for the supernatural, a place run by the Novem, nine of the oldest (and strangest) families in New Orleans. My heroine, Ari, is a hardened teen, with some unique qualities. She’s searching for answers, clues to an obscure past that lead her to New 2 (what folks now call New Orleans). With the help of some misfit kids living in an abandoned Garden District mansion, Ari discovers a curse that has stood since the time of the gods, one that is beginning to stir inside of her and ignite the age old war between gods and monsters. It has a dark, lush, gothic feel. The city is decaying, ebbing back into the swamps, so the atmosphere is very dark and creepy. And I'm blending some ancient mythology (the gods) and the vampire, witches, & shapeshifter mythos (the monsters) together, connecting them with an ancient curse that lives inside of my heroine. What inspired you to write DARKNESS BECOMES HER in this setting? My love of all things dark and creepy. And my love of New Orleans. It’s such an inspiring city with so much history and amazing architecture. But I also wanted to make the city different, to move it into the future by a decade or so, and, at the same time, make it resemble the days when the city was a frontier town and first being carved out of the swampland. Only now instead of rising out of the swamp, it’s sinking back in. And I love the idea of, for instance, the Garden District taking on an abandoned air, those great mansions being covered by Spanish moss and vines, and yet still standing and housing strange inhabitants. How did you come up with the name 'Kelly Keaton' for your new YA series? Keaton is a family name. My grandparents held that name, and my grandmother is credited with opening my mind to world of fairies and all things fantastical. She'd take me for walks in the woods when I was a child, holding one hand, while pointing out mushrooms and tree stumps with the other, telling me those were fairy castles and umbrellas. She had such an amazing, creative mind, and she was a big supporter of my writing dream. She passed away less than two months before I sold my first book. She would’ve been thrilled to tears to hear that news, so I’m just really proud to bear her name in this way – I know she’s getting a big kick out of it! Kelly – thank you for stopping and answering a few of my questions! Leave a comment or a question for Kelly. Giveaway ends on Monday, November 23rd at 8PM CST. If the winner lives in the US the book will be come from Amazon.com, outside of the US it will come from The Book Depository. I really love the description of the New Orleans you created for your book! Since Donna highly recommended this book on twitter I'm entering! The question I had was about Sirens - what are they and tell us a little bit about the male Siren character in this book? I retweeted you but I can't figure out the retweet link on this newfangled RT feature on twitter. Argh. I think many will want to thank your critique partner for her enthusiasm that kept you going Ms. Gay. I know what novel is going on my wishlist, I'm really intriguid by the world and the single mom Charlie. Hi Janica! *sigh* the siren... So beautiful and yet so full of themselves. Now, Hank, on the other hand, doesn't take himself too seriously. He's a bit different than other sirens (but I can't tell you why). In Elysia, sirens fall just below the Adonai, the Divinities of Elysia, in heirarchy. Their voices are their power. In our world, they're required to wear voice-mods to adjust their supernaturally alluring voice... But that's all I can tell you! I'll be doing a guest post at All Things Urban Fantasy about the sirens, so I can't give the post away! (I'll make sure to mention the date and time on my blog). After reading the review posted for this book I am intrigued enought to want to read it. Thanks for the chance to win a copy. Excellent review and now I need to read it.This is my kind of read. Thanks. Thanks for stopping by. I've read great things about your book. It's been on my TBR pile since I first saw the cover. Congrats and wishing you continued success. Donna thanks for inviting Kelly for an interview and for the contest. Awesome interview and I love settings in New Orleans. It just adds another layer of mystery and darkness to a story! I love the title as well as the cover of your book. My question is what makes your supernturals different than what is already out there. Thanks for the interview. I love New Orleans and anything set there, so I definitely can't wait to read about your New Orleans!! 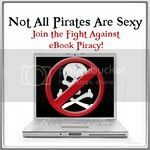 Great interview Donna, I must get my hands on Kelly Gay's books! This looks like an exciting book. The cover is great. I can understand why you are pleased with it. I have seen it around the blogosphere a bit which is nice. Your young adult series sounds fun too - post apocalyptic is so hot and in New Orleans even spookier. Would love a copy of any of your books. I have re-tweeted your tweet this morning about this interview. I love the cover art! I am glad to hear you had a voice in that. Great choice. Which did you enjoy more (Kelly) writing young adult or Urban fantasy? I'm a follower of this blog already, love the blog. I am such a sucker for books set in New Orleans! This is definitely on my TBR!!! I also like that your heroine is not "cookie cutter". Congratulations on your release! BreiaB: I'd have to say what makes them different is in the details. My supernatural characters are based upon myths already known in our culture, so you'll see a resemblence to creatures you know. But I really wanted to go beyond the popular image of demons, angels, gods, and other creatures, and put my own spin on things. What I did was to make changes to them physically, rework their origins and their powers, and I also threw some myths and details right out the window and started from scratch. I don't want to give examples here, since that might spoil it for some, but I think you'll see a lot of cool, unique details and changes in some very old myths/creatures you recognize. Hi Mardel! :-) Which did I enjoy writing more UF or YA? That's a difficult question to answer because my young adult *is* also an urban fantasy. I love writing in this genre. One of my greatest joys when writing is world-building and character creation, but I couldn't chose a favorite world or main character -- don't make me do it, Mardel! :D LOL. No need to enter me (although it kills me to say that). I'm dropping in to say thanks for the e-mail. I've got this posted at Win a Book for you. I can't think of a question to ask-everything was thoroughly covered in the interview-which was great! I'm going to re-tweet this now! I am so glad that I stumbled upon this title earlier today and then found this interview. The book sounds like it would fit perfectly with my reading tastes! The YA series sounds really good too. Nice interview, please do enter me. I have seen this book popping up at places and it does have an interesting heroine say the least. Donna's review confirmed my hopes for BPOD. I'd love to win a copy. Kelly, I love the way you've described your incorporation of greek mythological figures into the modern world, I will definately be looking up your books at the bookstore, in the meanwhile, please sign me up fot the giveaway! Great Interview.This book has been on my list to get for months,I can't wait to read it. That was a great interview! Ilove what the author has created for New Orleans! Congrats to her for her new YA series "DARKNESS BECOMES HER", i really like the sound of this one! Enter me for this drawing! I enjoy roaming the older parts of New Orleans when we visit there. I also like the 'what ifs'. Your book sounds like it would be fun to read. The book sounds like loads of fun! Can't wait to get my hands on a copy! I may be outing myself about what life stage I'm at by saying this, but I LOVE it that an UF character has a family. I'm still relatively new to the genre, but it has certainly struck me that most heroines seem to live on their own, at most conceding to try being with a romantic partner by the end of a story. But kids? Don't recall any. That in itself makes this story different from the pack. Here's my Q: what is it that differentiates paranormal from UF? Because of lot of the latter seems to include the type of fantastical creatures to be found in the former, so I'm not quite sure. I love this book and the cover rocks. I would so love to win this one. I am going to add this to my contest list on my blog. This new series sounds amazing. I like the idea of a divorced mom of one. This could through a lot of crazy things in the mix. I would love to be the winner of this book to get a great read in. I have also added on my side bar a link for this post to try and bring more people over for you. I do want to wish you the best of luck with your book sales! Great interview! This book sounds interesting...definitely something I would love to read. M: Paranormal is a pretty broad term and can, unlike UF, encompass a lot of sub genres: young adult, romance, horror, mainstream fiction, historical fiction, fantasy, and it can even be used to describe urban fantasy (b/c all UF has parnaormal elements), etc... It can take place any time, any place with any kind of narrative. Urban fantasy, on the other hand, is a pretty definitive sub genre nowadays. Everyone has their own opinions on 'what' exactly it is, but the genre can *usually* (there are exceptions here!) be defined by a first person narrative, set in a city or urban-like setting, and is *almost* always contemporary. It's dark, gritty, edgy. Also, in UF, you will almost always find that there are no happy endings. The characters are always testing themselves and their relationships. And relationships, in general, fall into secondary roles to that of the main character's journey. That is really the focus of UF -- the protagonist's journey. Kelly - that is one of the best explanations of Urban Fantasy that I've read so far. Thanks! Great explanation on UF. What made you choose that for your genre? I am really looking forward to the 20th when THE BETTER PART OF DARKNESS is released! Great review, I like the vibe of this book and I will check it out! Great interview. This book sounds really interesting, I would love to read it! Oh, cool. I was hoping that explanation made sense! And, might I also say: it's really awesome to see so many familair faces here -- thanks for stopping by you guys! Donnas: What made me chose UF? Can I answer with an 'it chose me?' :D I think it was two things -- one was that I was reading a lot of UF before starting the book and was hooked on the way the heroine is the focus. And two, BPOD is my 6 or 7th novel (it's early, and I haven't finished my coffee, so that fact is a bit foggy right now!) and when I write a story, I don't think of genre. I just write whatever is stewing in my head. Before BPOD, it was a young adult fantasy (not the one that sold), before that a paranormal romance... But, the one thing I suppose I do chose is the paranormal element that runs through everything I write. It's *got* to be there b/c that's what drives me when I create. And if someone asked me to write a straight, non paranormal story, I'm not sure I could! When the world and Charlie came to me, I knew immediately that she'd be best translated to readers as an urban fantasy heroine. It just all fell into place quite naturally. I'm not sure if somebody asked this already, please ignore me if I am repeating. I would like to ask Kelly if she uses real poeple around her as fodder for her books(?). Kelly, I really like the idea of New Orleans sinking back into the swamp from which it came. And that the Garden District is now the haunt of many a creepy being. Sounds very interesting. Please count me in. It sounds like a great book. All the books sound interested. I would love a copy. Hi again, and thanks to all the new commenters for stopping by! Loved the interview, and both series sound great! Please count me in, as I'd love to win a copy of Better Part of Darkness. The Better Part of Darkness sounds interesting! I love the cover art too! Wonderful interview and I have to agree that's one of the best definitions for uf I ever read. I have been dying to read this book. Please enter me. How is your writing process, do you schedule it like a 9 to 5 job, or are you more loose and set on inspiration? Oh, great interview and great giveaway! I read your answer to Strangelove so I'm going to ask something in the same area. You talked about editing and a lot of writers say that 90% of the time is reviewing/editing what they wrote. Is it the same for you? You were very lucky with the word play! Was there a point that you got a little bit tired of your characters? Of having to "deal" with them everyday? I really liked the way the interview was conducted and the honesty of the answers! Edu: I write pretty clean first drafts, so I think my revision percentage isn't as high as 90%. I usually do three revision passes, one to clean up the writing, fix any issues, and add in any research details. The second pass is a complete polish on the writing. And the third is usually a spelling, grammar, style pass to catch anything I might have missed in the polish. Cavalier: LOL. Nope. Never got to a point where I was tired of them. Now, by the time I went through the galleys, (which was probably the twelth time I read the book from start to finish), I was totally 'meh' with it!